This view looking towards the station from the Bramhall direction is no.1930 in the 'Milton Glazette series' published by Woolstone Bros. of London but printed, like most colour cards of the time, in Germany. 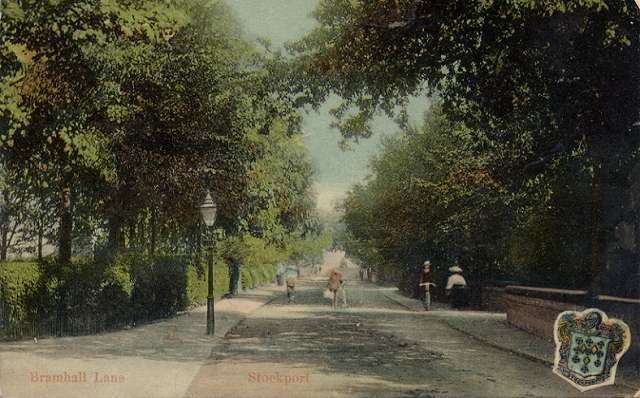 It was posted in August 1907 and gives a good idea of Edwardian Davenport; the original photograph, which might have been taken somewhat earlier, would have been in black and white: the colours have been added by hand in preparation for the printing process, distant details like St George's spire being lost. 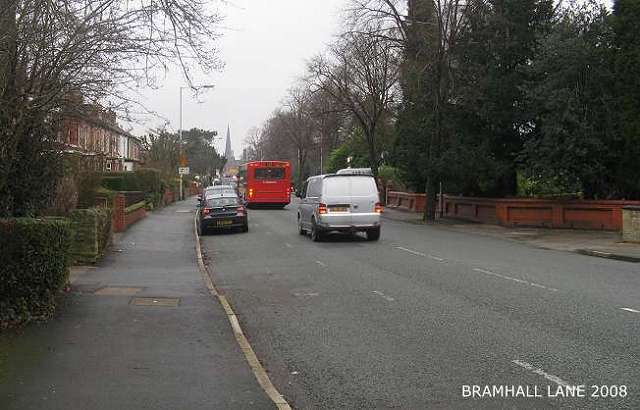 Bramhall Lane is a narrow country lane, and cycling on the pavement is nothing new - whilst someone else seems to be walking their bike down the middle of the road! To the left is the entrance to the drive of Highfield, the large house once owned by Stephen Christy of the Stockport hatting family. 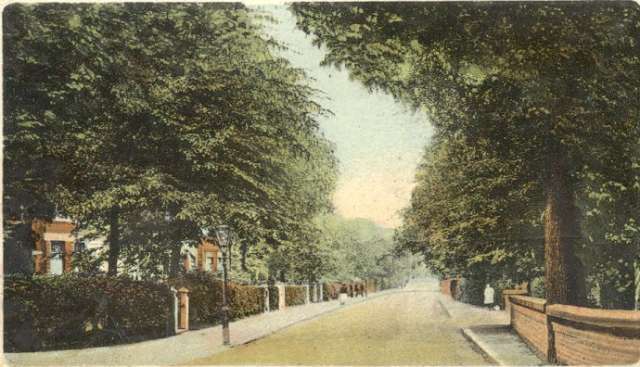 The drive to the right belonged to Beaconsfield, another of the large mansions from Davenport 's Victorian origins - home in 1910 of Isaac Leigh, 'gentleman' - demolished in the 1960s and replaced by the Mormon church. Three other large houses stood lay on the right hand side behind the trees. The first two were the homes of two hat manufacturers, William Ward and William Lees. Beyond, on the right-hand side, is the entrance to The Crescent. In the distance, the road rises over the railway station bridge. In the corne of the card is Stockport's coat of arms. These Milton Series cards can be found for very many places in Britain. This one dates from about the same period, but the viewpoint is on the other side of the Lane, bringing into view the houses on the west side. The two pairs of semi-detached houses nearest the camera were quite new at the time, but Oakfield Terrace beyond is somewhat older. Forward to circa 1950 and a real photograph from the end of the era of this type of local view postcard. The photographer has, by accident or design, stood in almost exactly the same place as his Edwardian predecessor. 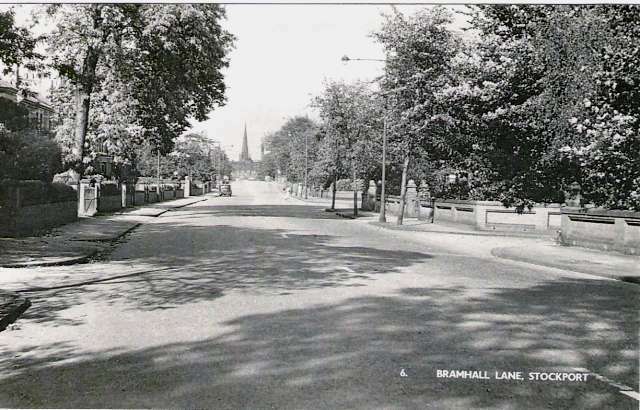 Bramhall Lane has been widened on the right-hand side, taking away part of the grounds of 'Beaconsfield' and replacing the front wall with a standardised brick style which can also be seen elsewhere on Bramhall Lane. The drive to Highfield is now more clearly defined: the house was by then occupied by the Mayson family who had purchased it after World War I and apparently removed part of it to create a more manageable home. The church spire forms the focus of the scene. Our own picture taken in 2008: achieving the exact same viewpoint as the other two could have fatal consequences, so we have resorted to the pavement. Some of the brick walls on the right remain, but the three large houses behind them have been replaced by more modern accommodation. The nineteenth-century houses in Oakfield Terrace to the left are now more visible, thanks to the removal of a tree. Highfield was pulled down in the 1980s, and replaced by the present apartments of the same name; the drive, now with stone posts either side, now forms the entrance to the nursing home which occupies what were originally houses built some time in the 1920s on land released by the Mayson family. And yet, despite all these changes, the view is not really so different from 1907; it would be even more similar had we taken the picture on a summer day.